June 22, 2018 Alumni, Landscape/Horticulture, Transportation & Natural Resources Technologies Comments are disabled after 182 days. 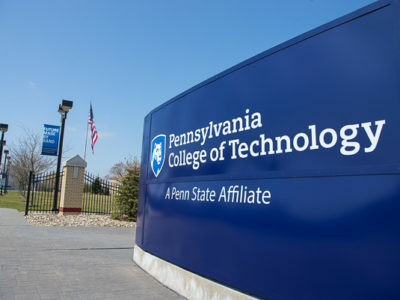 National “HortScholar” Aaron A. Sledge Jr., a May graduate in landscape/horticulture technology: plant production emphasis, welcomes Open House visitors to a Penn College greenhouse. The scholar program is open to undergraduate and graduate students, including recent alumni, who gain beyond-the-classroom experience on a national level. The awardees will help with setup, network with industry leaders, have access to multiple education sessions and attend CareerUP – a one-day workshop tailored to emerging horticulture professionals navigating the green industry’s career ladder. In his scholarship application – which was endorsed by Carl J. Bower Jr., an assistant professor of horticulture – Sledge noted a lifelong enchantment with plants that continued to bloom as a high school intern at Phipps Conservatory and Botanical Gardens near his Pittsburgh home and as manager of a greenhouse at Penn College’s Schneebeli Earth Science Center. Sledge has a summer job with The Plant Lady & Associates Inc. in Pittsburgh and is enrolled at Penn State this fall to work toward a bachelor’s degree in plant science with an emphasis on horticulture. For more about AmericanHort, which was founded through the 2014 consolidation of the American Nursery and Landscape Association and the Association of Horticultural Professionals, visit the organization’s website. For more information about landscape/horticulture technology and other majors in the college’s School of Transportation & Natural Resources Technologies, call 570-327-4516.